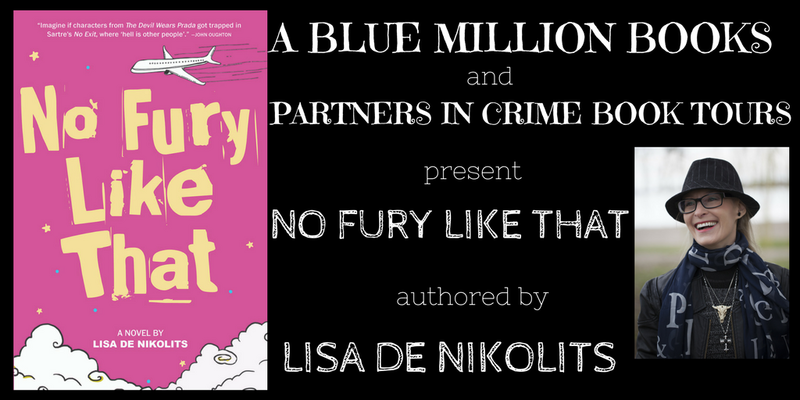 The novel takes you on a fast-paced, funny, adventurous ride, exploring themes of love, friendship, revenge and family – and the transformation of character in impossible circumstances. No Fury Like That is about metamorphosis and how friendship is more important than success, love is more important than money, and family is more important than power. What is your moral compass? Julia Redner has to die in order to find her answer to this question – but is she really dead or is she being given the opportunity to rethink her life while solving an intricate puzzle of murders? And she won't miss the opportunity to exact righteous revenge! A few of your favorite things: My rocks, stones, and shells that I’ve collected on my travels. My scented candles. Old notebooks filled with scribbles. Fresh, unused notebooks, waiting for new thoughts and words. Things you need to throw out: Old pens that no longer write. Old manuscripts that are good for nothing but collecting dust. Things you need in order to write: I just need something to write on and something to write with and then I am up and away! Things that hamper your writing: Incoming mails! I feel the need to answer them immediately and that interrupts me! Things you love about writing: I fall into another world, a highly entertaining world in which I have no idea what will happen next. Things you hate about writing: Inputting hand-written text. Sometimes I feel the need to write long hand, but then I rue the day and wish I had typed it in! Hardest thing about being a writer: Having to exercise the necessary discipline to keep at it. I can get quite grumpy about the slog of it all. Easiest thing about being a writer: It’s like a gift from the universe when a story is flowing. I feel blessed and alive and I feel as if everything is perfect at that moment, and I don’t want to be anywhere else, doing anything else. Things you love about where you live: I love the spirit of the land. Canada is a very mystical, powerful country. It’s a privilege to live here. Things that make you want to move: The mud!! Most of January, February, March, and April is just mud, mud, and more mud! I love the beauty of the miraculous beautiful snow but arghhh, the mud! The endless brown of the in-between seasons. Things you never want to run out of: Scented candles and ideas for stories. Things you wish you’d never bought: Skin creams that promised that my sun spots would ‘simply fall off’. What a waste of money, I was so foolish! Besides, my sun spots are well-earned souvenirs of my travels and my life. Words that describe you: Creative, thoughtful, kind. Words that describe you but you wish they didn’t: Impatient, critical, bossy. Favorite foods: Whipped cream, birthday cake, chocolate. Favorite music or song: Anything from the 80’s! Well, also the 70’s. And a lot of the 60’s. I lost interest in the 90’s. But bear in mind, "Blue Jean" by David Bowie is a fav and "The Tunnel of Love" by Dire Straits can still make me cry, so really, one cannot take my music tastes seriously! Something that gives you a pickle face: Beer with notes of citrus, burnt toast, plum, and coffee. I kid you not. Favorite smell: Vanilla. Lilacs. Freshly washed cotton. Everybody else’s laundry detergent smells better than mine! I have even knocked on neighbor’s doors to ask them what their detergent is. And yet, when I buy it, it never smells as lovely when I use it! I love the small of baking bread. Something that makes you hold your nose: Stewed garbage. Expensive fragrances with too many exotic high notes that stick to you like glue. Something you’re really good at: Meeting self-imposed deadlines. Something you’re really bad at: Working with team members who aren’t in sync with my sense of urgency! Oh, and I’m really bad at cooking. I cannot cook. I have no interest in it at all. And it’s so complicated – you need exactly this amount of a thing and then add it to that, for an exact amount of time. Cooking is extremely controlling. Something you wish you could do: Water ski. I tried once and got my hair tangled up in the rope. I was hauled into shore and that was that. I also wish I could worry less! I worry by habit, about so many pointless things! Something you wish you’d never learned to do: Make lists. Making lists can be a nasty addiction. And you know the thing with lists? They never end! Something you like to do: Read a book that distracts me from everything. Or find a great sub-titled mini-series on Netflix and binge-watch until the sun comes up. We recently watched Season 4 of Black Mirror which was incredibly disturbing and weird and thought-provoking. We also enjoyed Fargo and a French mini-series called La Mante. So good! Something you wish you’d never done: I wish I’d never given up karate when I was at brown belt level. I wish I had got my black belt. (Shotokan. I have looked into returning to it at various times but I just don’t have the time). People you consider as heroes: Nelson Mandela is my all-time biggest hero. I have no idea how he endured the hardship that he did and he stayed so positive and kind. People with a big L on their foreheads: I struggle with noisy people in public places, people who act as if they are the only people there. And people who nudge me in the back when waiting in line. Or people who tap their carts impatiently when you’re off-loading items at the till. Taking a little time isn’t going to hurt anyone! Last best thing you ate: A vanilla slice at Manly Beach in Australia. A vanilla slice is custard in between puff pastry slices, with a thick layer of icing on the top. Last thing you regret eating: A day-old Madeleine from Uncle Tetsu’s. Madeleines are amazing when warm and fresh. Things you’d walk a mile for: A photograph I want to take. A person I want to see. Things that make you want to run screaming from the room: Noise. And as I get older, I find noise harder to take. I am becoming quite noise-phobic! Things you always put in your books: At some point, my protagonist always has a long, hot, scented bubble bath. In No Fury Like That, Julia Redner has a Chanel bubble bath! Things you never put in your books: Cruelty to children and I’d never put children in danger. Only mild danger from which they can quickly be rescued. Favorite places you’ve been: Hong Kong. The lights! The pace! The hidden alleyways filled with treasure. One can explore Hong Kong for the rest of your life and never get bored. Paris. Rome. Blueys Beach, Australia. Barcelona. The veldt of South Africa. Auckland, New Zealand. Places you never want to go to again: Geneva. Such a bland and vapid place. The Houston airport. The Chicago airport. Airports are generally dangerous because if you spend enough time in them, you start to think that maybe it’s okay for a small coffee to cost you $7. Favorite books: Suspense thrillers. Detective novels. Noir. Novels that defy categorization. Novels with magical realism, novels with a social conscience. Novels with a fast pace that grab you from the start and don’t let go. Books you would ban: I wouldn’t ban a book. I believe that books should be allowed their place in the world, no matter what their content. We can choose to read them or not. People you’d like to invite to dinner: Salman Rushdie. Margaret Atwood. Annie Proulx. Lionel Shriver. Joyce Carol Oates. I think there would be quite a heated debate! People you’d cancel dinner on: Actually I am very good at canceling dinners even with my closest friends! And that’s because I’d pretty much always rather be at home writing! My friends, thank heavens, understand, and we do coffees here and there and breakfasts. I don’t cancel breakfasts! Favorite things to do: Have a nap. Browse through antique stores and markets. Take photographs. Hang out with my cat. Step back and admire the temporary cleanliness of my house after a fit of cleaning. Things you’d run through a fire wearing gasoline pants to get out of doing: Hosting a dinner party. Things that make you happy: Being with my husband, lost in the middle of nowhere, taking photographs. Buying presents for my family. Watching my family being happy. Talking to my cat. Hugging my cat. Things that drive you crazy: Being stuck in traffic. I get extremely impatient! I don’t drive so I don’t have road rage or anything, I just hate grid lock. Most embarrassing moment: Gosh, this is a hard one! One that comes to mind is when you think someone is waving or saying hi to you and you wave back and get all enthusiastic and then you realize they are waving at someone behind you. Proudest moment: Getting a hundred percent on my first spelling exam and getting a certificate for it! I’ve never forgotten that! I am also proud of all the places I have visited and all the adventures I have had. Some of them haven’t been easy and I’m proud of myself for trying. Biggest lie you’ve ever told: I’m not evading the question, but I really can’t think of one! I think that lying always comes back to bite you. A lie you wish you’d told: While I wouldn’t have wanted to lie, I do wish I had kept my council and been more politic at work in my day job over the years. I have certainly learned to be more circumspect in my opinions and careful with how I voice things. Also, in South Africa, you can be quite blunt and no one thinks you are being rude. But in Canada, the land of politeness, they do like you to be polite to the point of blanketing your words in cozy, almost neutral terms. But perhaps this is a global trend? Best thing you’ve ever done: Traveled the world. Married my husband. Kept on writing when really, it was going nowhere. Biggest mistake: Doubting my decisions, second-guessing. I do the best I can at whatever moment that is, and I need to trust that. The word mistake is such a harsh one! There are certainly things I would do differently if I had the chance to do them again but at the time, I did the best I could. Most daring thing you’ve ever done: I took the chair lift up to the Great Wall of China. I am terrified of heights, absolutely petrified. And you dangle over what looks like the Grand Canyon, rocking back and forth, on this tiny, rickety old chair lift, swaying casually, ridiculously close to death. I nearly died of fright, actually. But I made it! Something you chickened out from doing: I couldn’t have an MRI done without sedation – I kept chickening out! So they rescheduled me. And when my periods of claustrophobia were really bad, I wouldn’t go on the subway or in elevators or through revolving doors. But I addressed that problem and now I can do those things, no problem! The last thing you did for the first time: Climbed a dormant volcano! On the island of Rangitoto, in New Zealand. Something you’ll never do again: Travel without a spare pen (or three). I spot the womb that birthed my arrival, that steel and black leatherette chair, and I can still feel the burning pain as I surfaced. I look out the window. The immaculate green grass between the runways is unchanged, as are the cotton wool clouds which are two-dimensional and cartoon-like in their perfection. A movie backdrop, Grace had said. Sometimes, it’s as if I’ve stepped into a graphic novel that been assembled using clipart. We walk for what feels like hours but of course, there’s no way of telling. Originally from South Africa, Lisa de Nikolits has lived in Canada since 2000. She has a Bachelor of Arts in English Literature and Philosophy and has lived in the U.S.A., Australia, and Britain. Lisa lives and writes in Toronto. 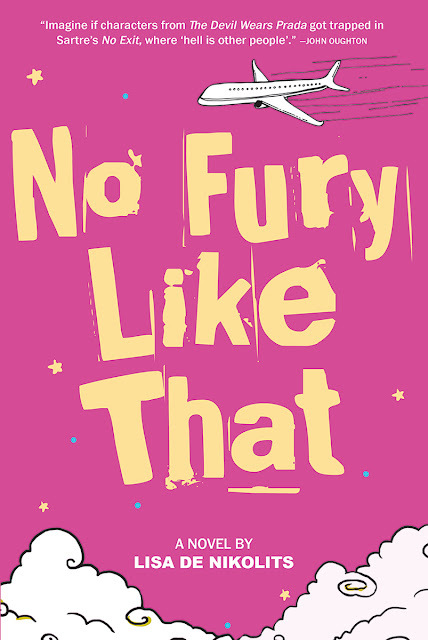 No Fury Like That, her most recently published work, is her seventh novel and has received glowing preview reviews from internationally acclaimed authors, Metroland Media, and high-profile members of the Crime Writers of Canada. 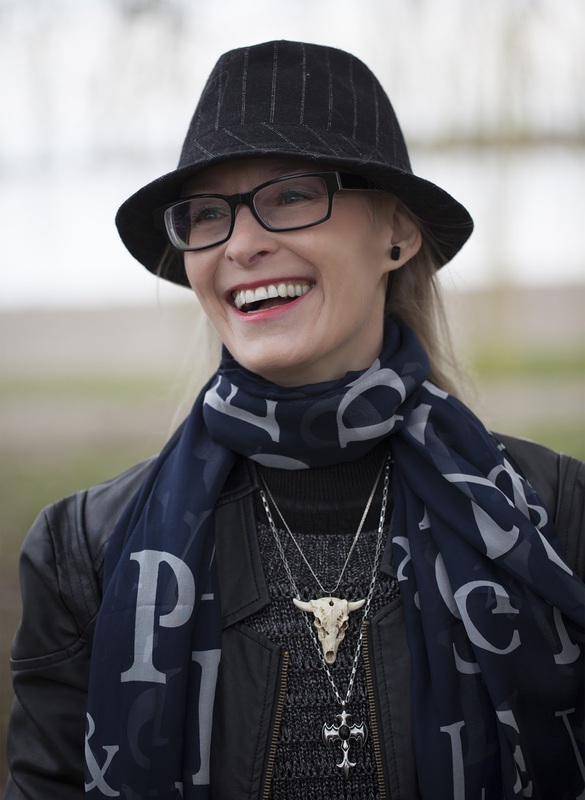 Lisa’s previous works include: The Hungry Mirror (2011 IPPY Awards Gold Medal for Women's Issues Fiction and long-listed for a ReLit Award); West of Wawa (2012 IPPY Silver Medal Winner for Popular Fiction and a Chatelaine Editor's Pick); A Glittering Chaos (tied to win the 2014 Silver IPPY for Popular Fiction); The Witchdoctor’s Bones launched in Spring 2014 to literary acclaim. Between The Cracks She Fell was reviewed by the Quill & Quire, was on the recommended reading lists for Open Book Toronto and 49th Shelf. Between The Cracks She Fell was also reviewed by Canadian Living magazine and called ‘a must-read book of 2015.’ Between The Cracks She Fell won a Bronze IPPY Award 2016 for Contemporary Fiction. The Nearly Girl received rave reviews in THIS magazine and local newspaper, the Beach Metro, among others. 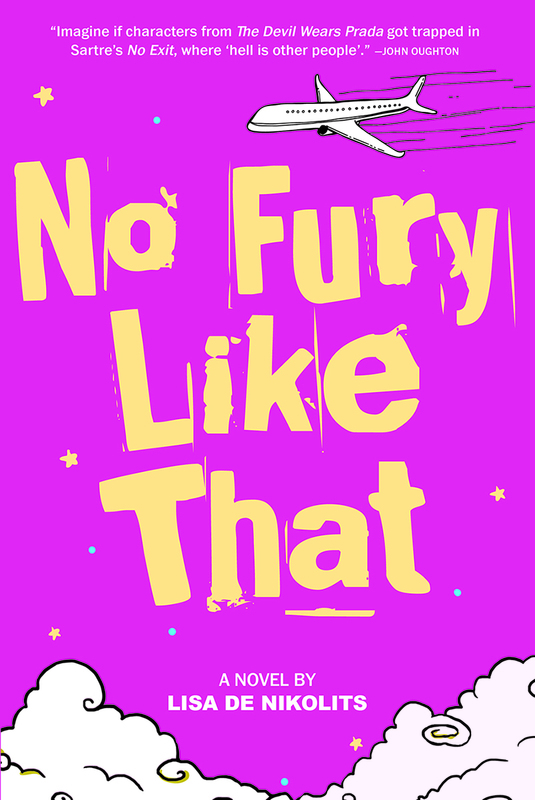 No Fury Like That is her seventh book and Rotten Peaches will be published in 2018, followed by The Occult Persuasion and the Anarchist’s Solution in 2019. All books by Inanna Publications.